Gníomhaí breithrialaithe agus oideachas gnéis Meiriceánach ab ea Margaret Higgins Sanger (Née Margaret Louise Higgins; 14 Meán Fómhair 1879 – 6 Meán Fómhair 1966). Altra a bhí inti agus d'éirigh sí ina scríbhneoir faoi na téamaí a bhain lena cuid gníomhaíochta. Chuir sí an chéad chlinic bhreithrialaithe sna Stáit Aontaithe ar siúl. Deirtear gur ise a chuir na focail "birth control" (breithrialú) i mbéal na ndaoine. Chuir sí eagraíochtaí ar bun. 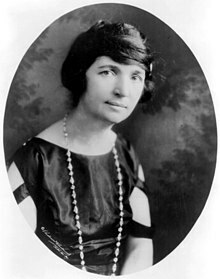 Mar shampla sa bhliain 1921, bhunaigh sí an American Birth Control League (d’athainmneofaí é Planned Parenthood i 1942). Rugadh Sanger i 1879 in Corning, Nua-Eabhrac. De shliocht Éireannach í ar an dá thaobh. Fuair sí bás in Tucson, Arizona. Tugadh an leathanach seo cothrom le dáta an 22 Deireadh Fómhair 2016 ag 06:44.